Now that my sewing space is all set and ready to go it's time to get down to business. 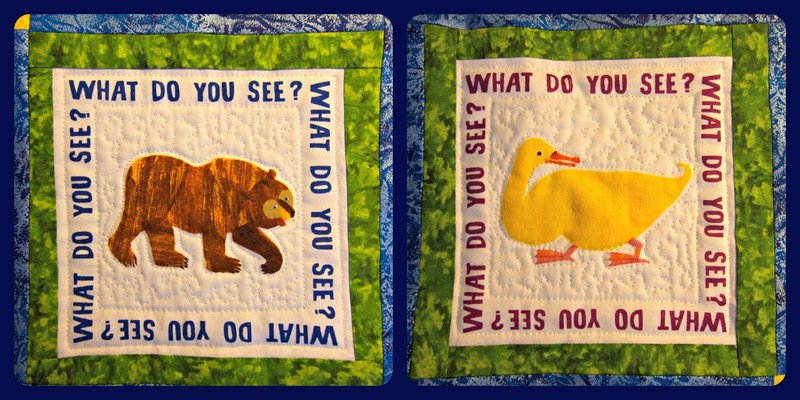 I have a basic game plan for quilting my Brown Bear quilt. I'm outlining each of the animals and stippling around them so they stand out. I'm also outlining/boxing the words that encircle the animals. I want to do some sort of scroll work for the sashing & cornerstones but I'm not quite sure yet. As for the striped border - I have no idea! Hopefully inspiration will strike when the time comes. the quilting really does make the animals stand out. It's too cute! I like the green fabric framing the animals. It's a nice tone on tone. Inspiration will come. :) Take care. Happy Quilting and have a good week. How cute! I think the scroll will look nice. Your quilting is looking great for this quilt! I love the way you've outlined the animals. It really makes them stand out nicely. Well done!